Dr. LeBlanc utilizes the latest advances in vision correction technology to provide cataract sufferers relief from their vision impairment. 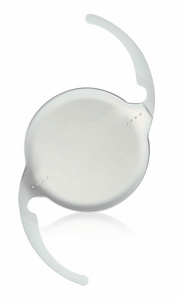 Dr. LeBlanc currently uses three TECNIS® IOL’s to perform cataract surgery for patients in the Lafayette area. With the TECNIS® Lens, you have the opportunity to rejuvenate your vision, making it more like that when you were a young adult. Traditional intraocular lenses can restore distance vision, but they aren’t designed to bring back the balance of youthful eyes. Images may not be as sharp as they could be, and you may be left with the functional vision of a healthy older person, not of a young adult. Using innovative wavefront lens technology, the TECNIS® Lens can restore your vision to that of a younger person. The TECNIS® Lens can improve functional vision so you can see well, even in low-light situations like driving at night, dining by candlelight or walking in a morning fog. Choosing which implant is right for you depends on the unique characteristics of your eye, as well as your lifestyle needs. Dr. LeBlanc will discuss your options with you and help you determine which lens is best suited for your eyes.